This whole story starts with me looking at the grocery list on the kitchen counter and seeing that a family member has written MAYO. Well, at our house, mayo is one of the staples that we do not want to run out of. In fact, it is one of the items that I always have two of, one in the fridge and one on the pantry shelf as backup. So when I saw mayo on the list, my first reaction was to check the pantry for the backup jar. But noooooo, the family member had not put mayo on the list when they opened the backup jar. They waited until there was about one teaspoon of mayo left in the jar in the fridge to write it on the list. I just rolled my eyeballs and sighed. But what I did discover in the pantry was about 12 cans of diced tomatoes. I stood there and scratched my head, trying to remember why I had all those canned tomatoes. I don’t even remember buying them. Big Senior Moment. So I decided to cook something to reduce their population. Which got me thinking about the Goulash my Mom used to make in the 1950s, back when canned vegetables were in their heyday. My Dad was big into hunting and fishing. We lived in Minnesota after all, the Land of 10,000 Lakes. Every fall during duck hunting season, my Dad and his pal, Willie, would don their heavy canvas jackets, hip boots and wool hats and pack up their duck boat with reed blinds, shotguns, decoys, duck calls and Jack Daniels. Off to the slough (pronounced sloo) for a weekend of shooting and sipping. Many hilarious stories were brought back, along with the strings of dead ducks, from these adventures. Anyway, when my Dad was away, my Mom would make this Goulash. This was the only time she made it, maybe because my Dad didn’t like it. All I know is, I looked forward to duck hunting season every year because Goulash was going to appear as sure as those flocks of migrating ducks. A big pot-full and we could eat as much as we wanted and get stuffed. My Mom, me and my little brother, eating Goulash. A very good memory. 1. Cook elbow macaroni until almost al dente, not soft, about 6 minutes. I used about ¼ of the package, but it was more than I needed. Drain in colander and run cold water over to cool. Shake out water and reserve. It will finish cooking later in the goulash. 2. In a large dutch oven, heat olive oil. Add diced onion and cook over medium heat until soft and starting to brown. 3. Push onions to the side and add ground beef, breaking up into small pieces. Cook until starting to brown and all liquid has evaporated. 4. Add 2 cans of diced tomatoes and their juice to pot. Cut any large pieces of tomato into smaller pieces. Discard any green tomato cores. Stir into meat mixture. 5. Put a strainer over pot and pour stewed tomatoes into it, allowing juice to fall into pot. Cut up tomato pieces and add to pot. Discard any little pieces of celery and other remains in the strainer. 6. Add chicken broth and tomato paste. Stir all ingredients in pot and bring to a boil. Turn heat down to a simmer and cook for 10 minutes. While simmering, add minced herbs and dashes of spices to taste. 7. Add salt and pepper. Mix in 3 to 4 cups cooked elbow macaroni to your taste. Add more salt if needed. 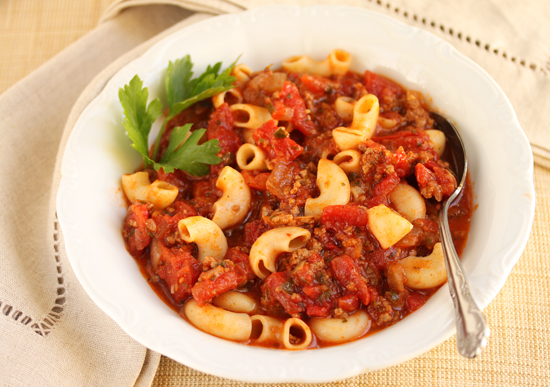 Reheat Goulash to bubbling and serve. a recipe…but now I do! Such an old fashioned comfort food. So thanks so much! My mom made this dish, too, and we kids loved it (but not my Dad). 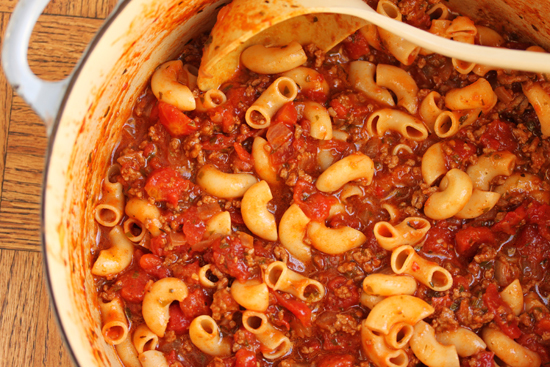 In CNY we called it goulash, but according to a long ago Midwestern boyfriend in MN it is a potluck/church dinner/ funeral casserole known as “hot dish”. My best friend and I were just talking about this over the weekend! My grandmother would make this in the fall too, but she added zucchini to it. I’m glad you left out the mayo! This looks so good, perfect for a big family. I hope you make it to your pantry more often. Tried this last night and it was very tasty. I didn’t add the Italian herbs because the other herbs seemed more than adequate. I only used one can of diced tomatoes, since two would have made the dish more like soup than goulash. Also, I’m not sure what the stewed tomatoes added. Next time I think I may add some chopped up whole, peeled tomatoes and a teaspoon of sugar if I need extra sweetness. For pasta measurement, using one-half of the cooked amount for the dry calculation seemed to work out correctly. I’m a Minnesota girl transplanted in Chicago. No one here has ever heard of Goulash here! I grew up eating this once a week in Minnesota. My mom pulled out her biggest pots/pans and we all helped out. There are 9 of us kids and we all gobbled this stuff up! Your recipe is almost identical to my moms. Sadly she never once wrote down the recipe for us. Now as adults we have all created our own version but no one can make an exact duplicate. Thanks for posting your recipe, I’m gonna give it a try!